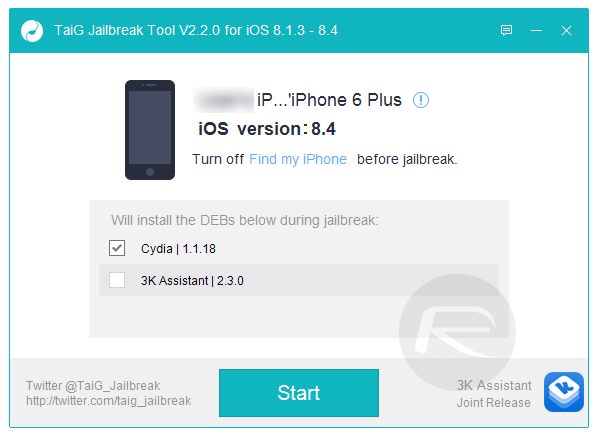 Here’s how to jailbreak iOS 8.4 on iPhone, iPad, iPod touch using the newly updated TaiG v2.4 tool for Windows. 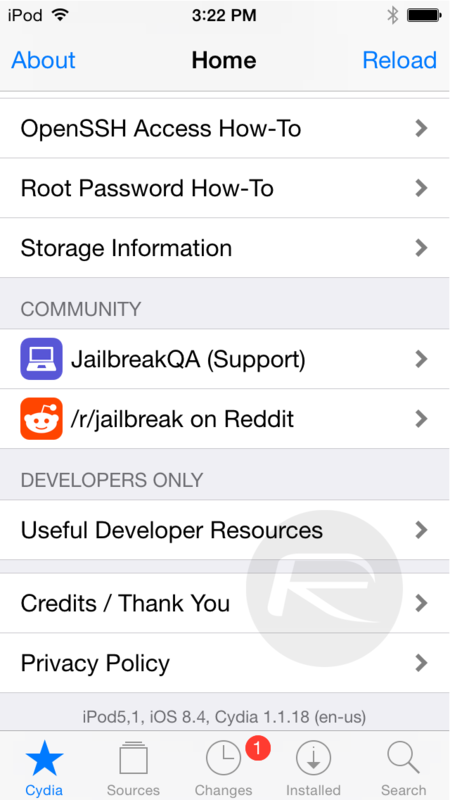 With iOS 8.4 now being available, TaiG was swift enough to release an updated version 2.4.1 of its jailbreak tool that supports Apple’s latest mobile OS. If you’ve ever used a previous versions of the TaiG tool, then you’ll feel right at home with this. If you haven’t, then fret not, we have a complete step-by-step guide to walk you through the whole process of jailbreaking iOS 8.4 on your iPhone, iPad or iPod touch. Note: The tool is still currently available for Windows users only and supports iPhone 6 Plus, iPhone 6, 5s, 5c, 5, 4s, iPad Air 2/1, iPad 4/3/2, iPad mini 3/2/1, iPod touch 5 running iOS 8.4 all the way down to iOS 8.1.3. Also before you begin, you must make a complete backup of your data either using iTunes or to iCloud. Step 1: Download the new TaiG jailbreak tool from here: Download TaiG 2.2.0 iOS 8.4 Jailbreak For Windows (Update: A new version 2.4.1 is now available, download that instead from here). Also download and install the latest version of iTunes from apple.com/itunes. Step 2: Restore to iOS 8.4 from scratch on your device using iTunes. This is important as OTA updates tend not to play nicely with modern jailbreaks like TaiG. You can download iOS 8.4 for your device from here: Download iOS 8.4 Final IPSW Links For iPhone And iPad. Step 3: Disable Find My iPhone on your iOS device. 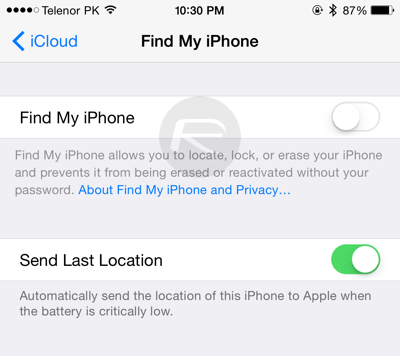 Navigate to Settings > iCloud > Find My iPhone and turn off the ‘Find My iPhone’ toggle. You’ll be required to enter your Apple ID password to confirm. Step 4: Disable Passcode and Touch ID unlock. 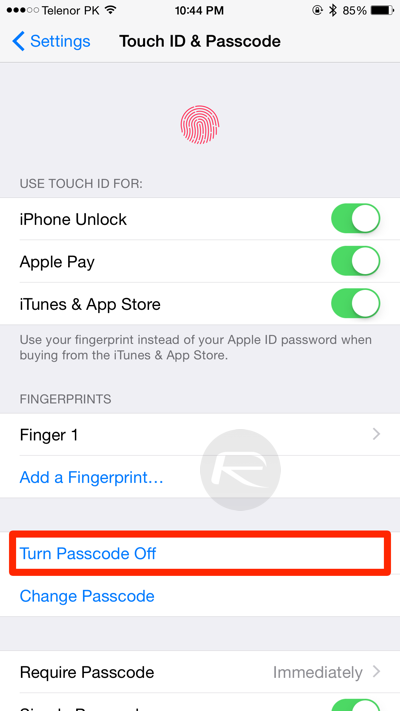 You can achieve this by going to Settings > Touch ID & Passcode and then tapping on the ‘Turn Passcode Off’ option. Step 5: Connect your iPhone or iPad to your PC and launch the TaiG jailbreak tool you downloaded in step 1. Step 6: The tool will now identify your device. Once it’s done, simply click on the ‘Start’ button to kick off the jailbreak process. Make sure you uncheck the ‘3K Assistant’ box before you begin. Step 7: After a few minutes your iOS device will reboot and you’ll see the Cydia icon on your home screen, confirming that the jailbreak process went smoothly. After the jailbreak is complete, you can safely turn on both Find My iPhone and Touch ID/Passcode options which you disabled in steps 3 and 4 above. Having any issues with the jailbreak? Follow our troubleshooting guide here: Fix TaiG iOS 8.4/8.3 Jailbreak Stuck At 20% Error 1101, 1102, 1103 And More [Troubleshooting Guide]. Let us know how the jailbreak went for you. Mac user? Follow the OS X specific instructions detailed here: How To Jailbreak iOS 8.4 With TaiG On Mac OS X.
its a long process and you guys need lots of patience and u guys have to tinker about alot and finally taig is able to jailbreak the device. Mission Success! sucessfully but the ipad get stuck at apple logo, what should I do ? I use Ios 8.4 on my iphone6. Itunes 12.2.2.25 If I try t jailbreak with the latest version TAI 2.4.3 the software tells me, that I dont have a Apple driver. But I have one because Itunes works with the Iphone 6 and Ios 8.4. What can I do? it says that i cant open iTunes (12.0.1). on taig there it means’ update to ios 8.2.’ but i dont want to.. pls fix it…. Anthony, update the Taig then try again i had the same problem, but i just jailbroke my iPod. what if i didn’t disable find my iPhone ?!?! If you are having trouble ՍΝᏞΟᏟΚing AT&T phones, go check out just google atttiphoneeuunlocking, it’s no doubt the best site for սոⅼοсking AT&T phones, we have the electricity to ՍΝᏞΟᏟΚing the new 6S and 6C as well. Hello, I have the same question as Nawar…What if I’m trying to get rid of the icloud login by Jailbreaking the phone? Thanks in advance. If this is not a proper question to ask here, please let me know. I noticed that a couple of these questions were left unanswered.